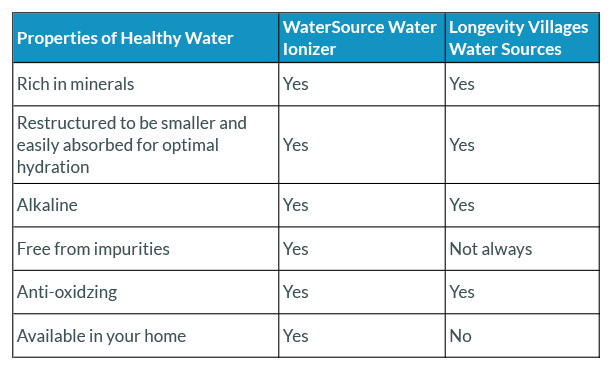 What is a water ionizer and what are the benefits of owning one? Do you need a water ionizer? If you care about your health and wellness, then you should have a water ionizer. There are too many benefits to gain from drinking alkaline water that cannot be obtained elsewhere. Healthy water promotes overall well-being. To be considered healthy, water must be clean, high in pH, rich in negative ions and micro-clustered. Longevity Village: A longevity village is a community where the average lifespan is years longer than ordinary. There are more doctors and scientists studying the water from longevity villages each year. The water from these villages comes from a variety of sources including natural springs and icebergs. However, only a very small and lucky percentage of people in the world live close to such natural, healthy water sources. Why does ionized alkaline water taste different? Ionized alkaline water tastes better and smoother because the water molecule cluster is much smaller than normal water. In another words, you will not feel bloated when drinking ionized alkaline water. Which level of ionized alkaline water should I drink? Start at level 1, proceed to level 2 after one week; then proceed to level 3 after another week. This serves as a guideline as some people need a longer time to adjust to the change of water; some people need lesser time. Levels 2 and 3 are good for regular drinking. How much ionized alkaline water should we drink daily? There are many theories about how much we should drink. Some say two litres while others say 30 ml per kilogram of body weight. However, from a medical point of view, the exact amount is still to be defined. The main function of this water is to help discharge body waste. Thus, the question of how much ionized alkaline water should be taken daily depends on the person. For example, people who play extreme sports and those who drink alcohol regularly need to drink more water. Such people should drink two litres of water daily. It’s especially important for chronically ill people, smokers, people who consume much acidic food such as instant food, and those exposed to contaminants, to drink 6 to 8 litres of water or at least 10% of their body weight in order to preserve their health. Is ionized alkaline water suitable for babies? As babies are naturally alkaline, take H2O for drinking. For making baby formula, it’s alright to take level 2 to neutralize. Our stomach is acidic, wouldn’t the alkaline water neutralize the acid in stomach? The answer is no. The pH of the stomach is about 4. This is due to the hydrochloric acid it produces to digest food. It is produced on an as-and-when-needed basis ie for digestion. When you drink alkaline water, the pH of the stomach increases. When this happens, the stomach produces more hydrochloric acid in response – in order to bring the pH down to 4. The by-product of making hydrochloric acid is bicarbonate which is alkaline; bicarbonate is sent back into the blood stream. These bicarbonates are the alkaline buffers that neutralize excess acids in the body. Click here for more explanation by Dr Sang Whang. Will we become too alkaline by drinking ionized alkaline water daily? The reason ionized alkaline water becomes alkaline is due to the minerals that are dissolved in the water. Our body has its own buffer system (phosphate buffer system or bicarbonate buffer system) which normalizes the body’s pH state, whether we drink alkaline water or acidic water. Bad things happen when our body becomes too acidic ie accumulates too much acidic substances. This will lead to all kinds of chronic illnesses such as diabetes, kidney disease etc. If the body’s pH level goes below 6.8, it is life-threatening. Can I boil ionized alkaline water? Will it lose its efficacy? You may certainly boil ionized alkaline water. However, boiling ionized alkaline water will cause the lost of alkalinity slightly and a drop of anti-oxidative (ORP) value. Dissolved oxygen in the water will also be lost. That’s why it’s better to drink directly from the ionizer, un-boiled. Boil only for the purpose of making tea, coffee, or other hot beverages, by the way, will taste better! Can I cook with ionized alkaline water? You may certainly cook with ionized alkaline water, especially recommended for cooking soup, rice, stew etc as it helps to reduce acidity in such food. It will also draw out the natural flavour, food will cook faster and taste better! How long can ionized alkaline water be stored? The best way to drink ionized alkaline water is to drink it fresh from the ionizer. However, storing it in a container for one to two days or so would be fine. It is advised to use an air-right container to prevent losing the negative ions, and best to use glass or BPA-free container. Why are there sand-like particles sticking to the side of my container after sometime? There is no cause for alarm. These are alkaline minerals present in the water, which could become visible in certain container. The stronger the ionization, the higher concentration of such minerals,, especially when the water pressure is low. Soak your container overnight with acidic water, brush vigorously and these particles will be removed. You may also add white vinegar for thorough cleansing. The ionizer dispenses H2O and acidic water also. What can I use these for? H2O – purified water that is suitable for taking medications and supplements so as not to interfere with them. Acidic water – this is the most natural cleaning water without chemicals. It is great for cleaning and disinfecting kitchen, toilet, utensils, chopping boards etc, useful for soaking laundry too. Acidic water is also known as beauty water as it is a natural, gentle and effective cleanser and toner for face, hair and body as it is very compatible to our skin’s pH at 5.5. It is also an effective mouth-wash for brushing teeth and gargling to soothe ulcer and sore throat. Is there any harm if I accidentally consume acidic water? Our ionizer is set at a safe acidic level of pH 3.5 ~ 6.5, as such, there is no adverse effect if you accidentally consumed. Prolonged consumption is, of course, discouraged. Does the ionizer require electricity? Do I leave it on throughout? Will it overheat? Yes, an ionizer requires electricity so it is important to ensure easy access to an electrical outlet, and you do not need to switch off unless going for long trips. No, our ionizers will not overheat as it is equipped with the latest technology – SMPS Plus. It saves electricity as when on standby, little power passes through.